PARIS – As US newspaper publishers battle plummeting sales and daunting credibility problems, they might look across the Atlantic for rescue from their plight. European newspapers face many of the same problems as their American cousins. An increasing number of them, though, are seeking salvation through a simple but dramatic change: they are going tabloid. The newest convert to this trend is the Wall Street Journal, whose loss-making European edition will turn tabloid in October, along with its sister Asian paper, the company announced this month. Nothing could better show that "the myth that big papers are respectable and small papers are sensationalist has been blown away completely," says Jim Chisholm, strategy adviser to the World Association of Newspapers. Newspapers across Europe have been trying many tricks to staunch the ebb of readers seeking their news elsewhere. At Italian newsstands, it is often hard to find the papers themselves among the children's toys, calendars, CDs, and paperbacks being offered as promotional gifts with dailies or weekly magazines. But such gimmicks offer only temporary respite, say industry analysts, and except for free papers such as the "Metro," circulation is falling for almost all papers, from the heaviest of the European heavies, France's "Le Monde," to the most sensationalist British tabloids. London's Independent was the first to reverse that trend. 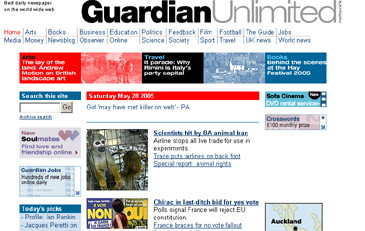 In 2003, it introduced a tabloid edition, sold alongside the broadsheet version to reassure readers that the content had not changed. Customers loved it for its convenience, especially on crowded commuter trains. The Independent's circulation rose more than 15 percent, year on year, and within months the broadsheet had disappeared. GOOD THINGS IN SMALLER PACKAGES? 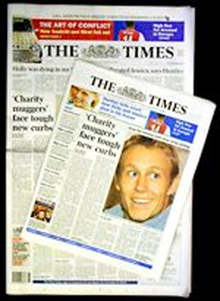 The tabloid and broadsheet versions of The Times. It was not long before the venerable Times of London followed suit, turning a circulation loss of 8 percent a year into a gain of nearly 3 percent. The Guardian, another of Britain's most respected dailies, announced recently that early in 2006 it would be changing to a "compact" form (a term editors prefer to the still soiled image attached to the word "tabloid"). "The resistance to the format change was much less than we had expected," says George Brock, launch editor of the tabloid Times. "I am not claiming that format change is the only key to attracting younger readers, but if it is correctly done it can help preserve your younger readership and build a loyal following." In Germany the serious Die Welt has taken a different, but equally successful tack. Last year the paper launched a daughter paper, Die Welt Kompakt, with no pretensions to containing the same content as its broadsheet parent. Though the compact version draws its material from the broadsheet, a small team of editors packages it differently into what the publisher calls "a paper to go." The target audience, says editor Jan-Eric Peters in a speech he will deliver next week to the World Association of Newspapers annual congress, comprises "young and mobile people who have not read newspapers on a regular basis, people who have little time to read a paper but ... who want to get all the news fit to print in less than 30 minutes. "Welt Kompakt focuses on news, while the strength of the broadsheet is reflection and background," he adds. "It's an easy-to-read paper about all you really need to know." And it has worked. Far from cannibalizing the broadsheet's readership, the new paper has contributed to a 10 percent increase in circulation for both papers. More than 50 percent of the compact edition's readers, says Mr. Peters, are under 35 who previously did not read a paper. Those figures, Mr. Chisolm argues, suggest that "the broadsheet is dead if the market prevails and readers get what they want." Downsizing the format, however, is not an option for every newspaper in trouble, least of all for some of Europe's most respected dailies such as Le Monde, or Italy's La Repubblica, which are already published on small pages. "Format itself is no panacea," says Chisolm, who has worked on four such transformations. The papers that have seen sustained circulation growth after going tabloid "have been excellent newspapers in other ways. "In the end," he adds, "what sells newspapers is good content." • Sophie Arie in Rome contributed to this report. The article is from The Christian Science Monitor.